Hi there! I hope your week has been nice so far. The weather here has been so nice- very warm and sunny. I love being outside right now but it worries me that it's only still March. I hope this doesn't mean that summer is going to be a scorcher ): I do not do well in heat. So here's a simple spring manicure; almost verging on summer with that peachy-coral base. 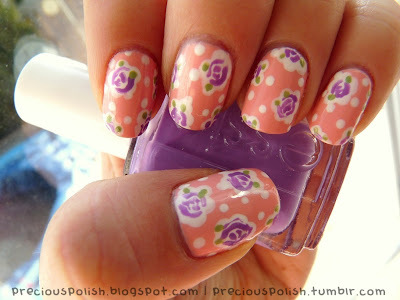 This design was featured in my post "18 Spring Nail Art Designs!" but it's not mine. I saw it on Tumblr first but I can't find the photo now. In any case I'm pretty sure it's a Cath Kidston pattern. I like that it's really easy to do but still a very effective crowd-pleaser. I started off with a base of Essie Van D'Go. I placed the dots and the flower outlines with dotting tools and a OPI Alpine Snow. I added the rosettes with a small brush and Essie Playdate and Essie Navigate Her for the leaves.